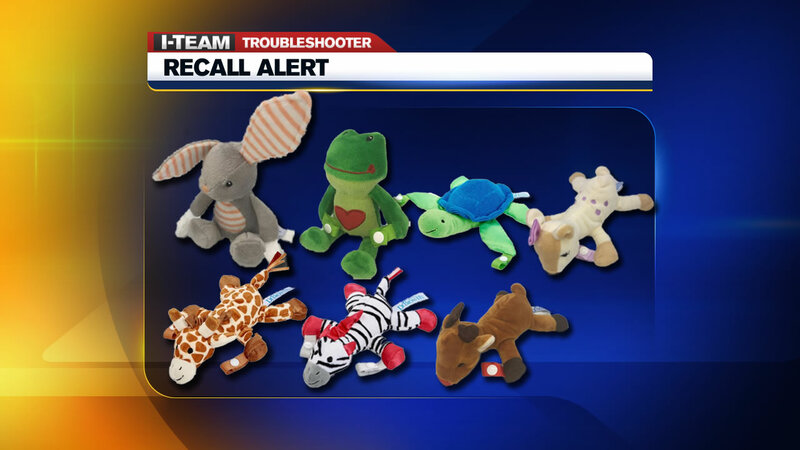 The stuffed animals are meant to help your infant hold their pacifier, but now the product is being recalled after choking concerns. The Consumer Product Safety Commission said the recall of about 590,000 Dr. Brown's Lovey pacifier and teether holders was ordered because of a snap that could detach and choke a child. The CPSC has received 67 reports on the ribbon fraying and the snap coming off, but the CPSC so no injuries have been reported. The holders sold in eight styles: Giraffe, Zebra, Turtle, Reindeer (Special Holiday Edition), Frog (Special Holiday Edition), Spring Bunny (Special Holiday Edition), Deer and Bunny. You can confirm if a lovey is part of the recall by visiting Dr. Brown's Safety Recall Notice. The holders sold at a number of retailers that included Target, Toys R Us/Babies R Us, Walmart, Bed, Bath Beyond, and also online at Amazon.